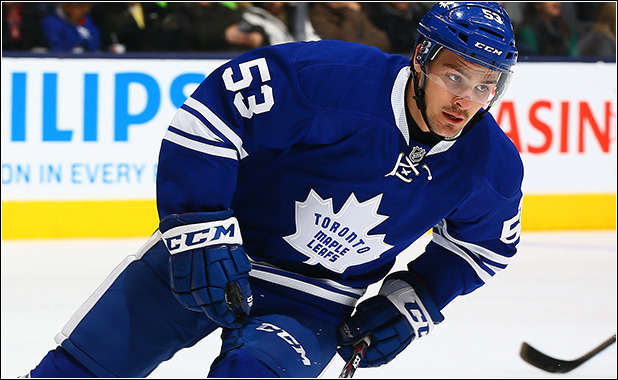 Picking up from the last episode on Colin Smith, today we're going to talk about another Marlies centreman: Sam Carrick. He's tough, he's energizing, and he's a lot of fun to watch if you're a fan of old school hockey. As mentioned above, one of Sam's most notable characteristics is his toughness. Check out this fight from his most recent NHL game against the Tampa Bay Lightning, back in 2015. He's not just a fighter though. His grit extends to other areas of his game, like fore-checking and defensive zone play. At the end of the day, though, Carrick remains, at best, a replaceable NHL forward. Once again we're in a situation where Carrick hasn't played enough NHL games (only 16) to be statistically relevant. Additionally, he hasn't played a single NHL game since signing his most recent contract, a 1 year deal worth $600k. That makes the data from his 2014-15 NHL stint somewhat useless. Once again we're in a situation where we have to rely on our qualitative instincts. Doing these posts has definitely made me wish I had access to the Maple Leafs' proprietary AHL data. Anyway, here are some contract scenarios for Sam Carrick for next year. If you've been following these posts you're sensing a theme, but I'll repeat nonetheless. We'll do an ideal, a realistic, and a realistic case, to make sure we cover our bases. Sam hasn't shown anything of promise this season in terms of making progress towards a regular NHL gig. Since this is the ideal case, this suggests that one of two quite ideal things happen: one, Carrick decides he loves it in Toronto he wants to stay without an NHL deal; or, two, no one else is willing to offer him an AHL deal. These are far from impossible cases, but certainly optimistic. The reason the Leafs would even want to bring Carrick back is, again, ideal. They'd have to value his contributions to the team atmosphere as well as those on the ice. Enough to let him fill one of probably two contested center spots on the Marlies. Realistically, Carrick probably doesn't get signed by the Leafs organization in any capacity. With Tony Cameranesi probably gaining one of those center spots, the Leafs would likely rather take a chance at turning someone else's trash into their own treasure than bring Carrick back. His season this year has left a lot to be desired, and it really doesn't look like he has much of a future with the Leafs organization. Whether he gets signed by another organization is up in the air, though. I could see Brian Burke signing him in the name of truculence, or Ottawa attempting to get back some of that peskiness they once had by signing Carrick. Either way, he may not be the Leafs' concern. Another repeat deal, like I suggested in the Nazem Kadri post. Since this is the pessimistic case, it means management disagrees with basically everything I said in the realistic case. They would want Carrick back, enough to allow him to take an ELC spot. However, even in the pessimistic case, Carrick does not earn a raise. Either way, whatever happens with Carrick won't be entirely notable. At least, not this Carrick. Later on in this series I'll cover name-sharing-but-not-related defenseman Connor Carrick. For today, reflect on whether Carrick means anything to this franchise going forward, and stay tuned for Episode 5, where we'll talk about former Vancouver Canuck, Frank Corrado.